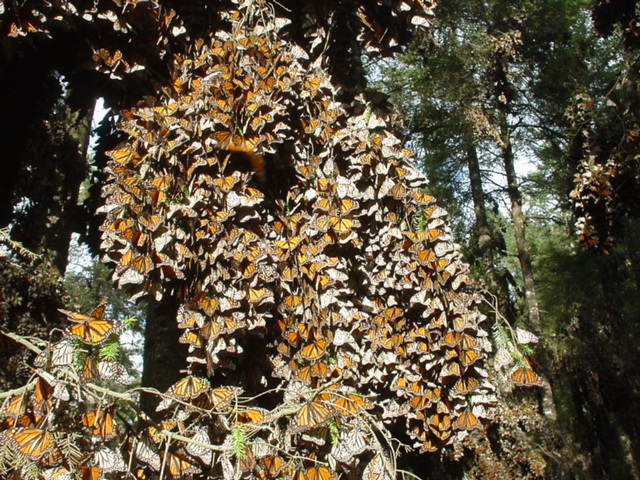 There are approximately 10-12 sites where the eastern population of monarch butterflies aggregate each winter in Mexico. These sites are large colonies estimated to contain millions of individual butterflies. Most years, an estimated 80% of the butterflies overwinter in only four core colonies. This distribution map shows which sanctuaries the butterflies had selected last winter (in December). The monarchs are not found in the same proportion each year at these colonies. The relative sizes of each sanctuary can be quite variable from year to year. For example, these pie charts compare which sanctuaries the butterflies had selected (in December) the past two winters. The area the butterflies cover in a colony is very small at any given time. However, if one considers the surface occupied by a colony from the butterflies' arrival in Novermber until their departure in March, it has been estimated at 60 hectares per colony. The butterflies move around considerably when they arrive early in the season. Initially they form many small, highly dispersed colonies. By mid-December, these many colonies coalesce into only the ten to twelve colonies that persist each year. 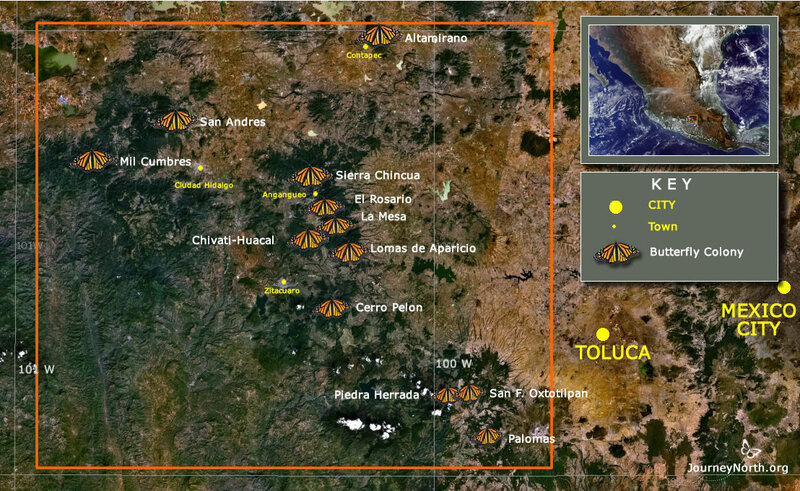 The monarch sanctuary region is only 40 miles wide and 62 miles long (65 km x 100 km). If you include only the boundaried sanctuaries, it is 16 miles wide and 43 miles long (26 x 70 km). 1.1 degree (71 mile) wide corredor to find the overwintering sites.